THON volunteers and supporters nationwide participate throughout the year in various events that give hope and support to families battling childhood cancer. The THON 5K is one of the largest races in Central Pennsylvania with over 4,000 runners and participants every year. Kicking off the THON season, this day includes a kid’s race, a fun walk/run, a family speaker, music, food, games, a raffle, and more! 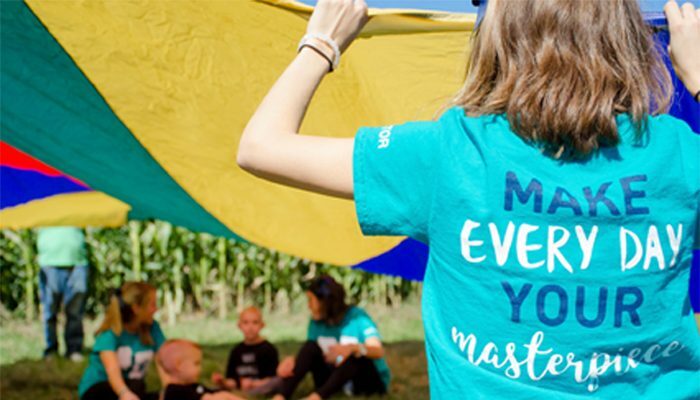 Harvest Day is a chance for Four Diamonds families to bond with the THON volunteers while playing games and doing fun activities at a local farm. Kids are given the chance to take a hayride, pick pumpkins and even run through a corn maze. For over six years, THON has partnered with Wigs For Kids, an organization that provides children and families with wigs at no cost. There are multiple hair donation events throughout the year, including a donation at the 100 Days ‘Til THON Celebration and an on-stage hair donation during THON Weekend. 100 Days ‘til THON is a university-wide celebration that generates excitement for THON Weekend. This all-day event features the previous year’s line dance, music from the Entertainment Committee, fundraisers, a merchandise sale and performances from student organizations. Various Penn State sports teams partner with THON throughout the year to host a game benefiting our efforts. These sporting events spread awareness and provide an opportunity for Four Diamonds families to travel to State College to spend time with one another and their respective paired organizations. The Road to THON Celebration recognizes the hard work that donors and volunteers contribute throughout the year. This event is a night full of awards, speakers, and dinner. Families have the chance to get an early taste of the THON Weekend energy and excitement at Family Carnival. Kids can play carnival games provided by THON volunteers and all attendees gather at the end for the highly anticipated annual THON logo reveal.